Custom caskets can turn a somber situation into something like peace. There may be nothing worse than losing a child. Picking out funeral flowers, writing an obituary, all the tasks that a death requires take on new meaning when everything has to be ordered in extra small. Funeral homes across the country are going above and beyond to personalize the burials of our littlest loved ones. If you’re looking for some ideas that might relieve some of your pain, maybe this round up of inspiration will help. A funeral home in Edna, Texas is getting creative with caskets for children and adults. This company can bury your loved one in a casket that looks like a train, a princess castle, or that’s wrapped in a photo collage of friends and family. This funeral home goes even farther than most and includes 3D elements on some caskets. A staple of their designs is the inside panel above your loved one’s head, which they turn into a unique tribute. This can be a picture of a sunset, a poem, a family photo, or anything you come up with. “We take a plain metal box and let the person’s soul shine through our custom casket design,” states Ganem, the company’s founder. 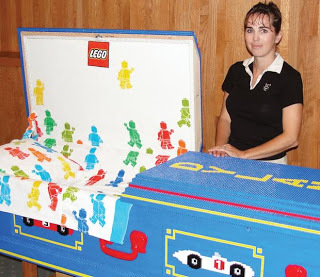 One ten-year-old boy was buried in a truly one-of-a-kind casket back in 2012: the entire coffin was made out of Legos, the tiny, interlocking building blocks kids go crazy for. The Girdner Funeral Chapel in Yreka spent a month and a half working with the Lego corporation, who assigned one of their Lego artists to take the lead on designing and building the blue, square casket out of more than 26,000 Lego pieces. The casket featured yellow race cars on the sides, red handles, and the boy’s name on the top panel. This memorable custom casket made funeral guests smile and inspired reminiscent stories and memories. It was the perfect addition to the personable and positive service. Self-proclaimed mountain man Charlie Hetrick, a Washington resident, is taking custom caskets to a new level by creating casket kits that require some elbow grease to put together. Hetrick will make the coffin for any size and shape, then send it to you in the mail in pieces. He’s open to customizations of all kinds, but the point of this method is more involvement in the burial process for those loved ones trying to grieve. Hetrick says one option includes a hammer and all the nails required to nail the lid shut, so the sealing of the casket can be done as part of the ceremony for maximum family involvement. Burying a child is different from burying an elderly parent or grandparent. Make the experience different as well by investing in the custom casket your loved one would choose themselves.